This book is often used as a GCSE study text although I seemed to have skipped it at school (I think we studied Z for Zachariah instead, which is also very good). I spotted this in a shelf full of sci-fi books at a local charity shop and it was the first one I picked up. 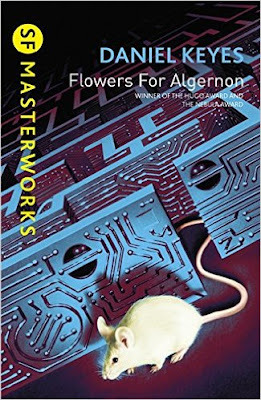 Flowers for Algernon is the story of Charlie, a young man with learning difficulties, who despite the challenges of life has a sweet and gentle nature. He is selected for an experiment at his local university that aims to enhance intelligence, an experiment initially tested on a mouse called Algernon with great success. As the experiment takes effect, we find Charlie’s intelligence and understanding expand and deepen to outstrip everyone around him. When the mouse starts to behave erratically and fade, Charlie as to question what that means for him. The book is written in the form of a diary which Charlie is asked to keep as a measure of his progress. The author deftly takes us on a journey through Charlie’s words, portraying innocence, hope, Charlie’s excitement and awakening and then his dawning realisation that the people around him are not always what they have seemed to the child-like version of himself. Throughout Keyes creates the doubts and insecurities that plague Charlie whether his IQ is low or high. This is not the sci-fi of space ships, aliens or killer robots. This is the kind of book that looks deep into the human psyche and nature and explores the effect of intelligence on the way the world treats you, the way you see it and your relationships. Charlie is lonely and alienated from those around him both when he can barely read or write and when he is considered a genius. The book was originally written in 1959 and feels very much of its time, with mentions of dance halls and a Strato-jet. But it also shines a spotlight on the treatment of people who were categorised as “retarded” at the time, whether in the community or in hospitals. I recently had a long conversation with a colleague at work who used to manage care homes for people with learning difficulties. She described how at the start of her career she would find people left with no games or radio or any other kind of activity to keep them occupied. They would share communal shower areas and rows of toilets without doors (shared between male and female residents). Most devastatingly, anyone with challenging behaviour that might bite had their teeth removed, the youngest person she saw this done to was 23. So the descriptions of the hospital where “retarded” young men are sent is quite upsetting. A deeply moving, heart-breaking little book.